I like Dr. Dean quite a bit. He examined me and told us what to expect in the coming months and was quite willing to answer questions about things like immunological function as it relates to Hodgkins. Not stuff I really need to know, or that anyone necessarily knows the answer to. I had shingles three times before I was diagnosed with Hodgkins, and no one can know if that's related, but it's not stupid to wonder. I like people who think I'm not stupid. I like doctors who talk to me. Bob gave him the address for my blog, so if you're reading this, Hi Dr. Dean. And thanks. If Kafka were writing today, he'd write about hospitals. Bob and I spent a large part of today wandering through large medical complexes with oddly numbered offices. Much medical jargon will follow. If you hate medical jargon, this is your chance to bail. I had a pulmonary test--which means they wanted to see if my lungs were okay. The test involved breathing into a tube. During my first rounds of chemo, I had some lung damage because of one of the chemo drugs, but I am happy to say that my lung function is normal. I've done the breathing into the tube thing before, and I really like the pulmonary technician, whose name is Kenny. Kenny was really good about explaining the test results to Bob and me. He's also really good at getting me to do the tests right. It's one of those things where you take a deep breath and then blow air out long after it feels as if there is no air left in your chest. Kenny has the ability to be a good cheerleader without being patronizing. Then I had a MUGA Scan. As I have told a couple of people, MUGA sounds like something you'd find on an Indian menu. But it's actually a heart scan. My red blood cells were 'tagged' with a radioactive tracer, and then pictures were taken with a gamma camera. I have a fair idea of what that might mean. If you have a high speed connection and want to see what the result of a MUGA Scan looks like (although, thank goodness, not my MUGA Scan because apparently this one shows pretty serious heart disease) click here. If you have dial-up, I wouldn't recommend it. It's not that exciting. I don't know what the results of that test were, but nobody expects problems. Then we drove up the freeway to another large medical complex and met with the doctor who will do my biopsy. He's very cool. For one thing, he also described me as 'young'. I'm 47. Only oncologists and cardiologists think of 47 year olds as 'young'. The biopsy will be either Monday or Tuesday and involves sticking a tube with a scope on the end into my chest and sniping off a piece of a lymph node. I'll go home after that and they'll send the tissue off to pathology where over five to seven days it will be subject to elaborate tissue staining techniques which will confirm that this is Hodgkins. I mean, there is a very tiny chance that it is something else, but that would be a malignancy as well, so I'm probably still better off with Hodgkins. By the time we left the last doctor it was snowing like mad and traffic on the freeway was miserable. But Bob got us safely home. Tomorrow morning we 'have a consult with the transplant specialist.' Is that not fabulous? I mean, they're going to draw blood from me, centrifuge the stem cells out, and put the blood back in me. Then after I have all the chemo, they'll put the stem cells back in. That's the transplant. I expect transplants to involve ice chests and organs and people having to get places in a hurry. Not sticking blood in a freezer and then thawing it out and putting it back in the same person. Although it's nice to think of an organ transplant that benefits both donor and receiver. Having to shave my legs. The schedule is falling in place. I can't be treated until the protocols of medicine have been appeased. Monday is the day of tests in which we determine that I am healthy of heart and lung. Monday is the day when we discuss and schedule the biopsy with the chest surgeon. Tuesday is the day we meet the transplant specialist and discuss the Bone Marrow Transplant, which is not really a bone marrow transplant. It is also sometimes called a Stem Cell Transplant. The official name is Peripheral Blood Stem Cell Transplant (PBSCT). It used to be a Bone Marrow Transplant where they took the patient's bone marrow, treated them, and then replaced the bone marrow. It was, in those days, a harrowing series of procedures and often fatal on its own. Now they skim my stem cells out of my own blood and keep them while I am treated and then re-infuse me. It is not, to quote Jeanette, my favorite oncology nurse, a walk in the park. But to quote Dr. Schnur, mortality is no longer a major issue. I suspect this will happen in April. But we'll know more Wednesday. It all sounds incredibly interesting, I have to admit. I'm kind of hoping that at some point I'll have an MRI. I've had CT Scans, PET Scans, chest X-rays, echocardiograms, pulmonary tests and lots and lots of blood tests, but I've never had an MRI. On television, MRIs are as common as dirt. I love looking at CT Scans and PET Scans--maybe for my next author photo I could use a CT Scan? Even X-rays are cool. I'll be treated downtown at the Cleveland Clinic. The Cleveland Clinic is about the size of the town I live in. A medical city, gleaming twenty blocks in the middle of what is otherwise a less than savory part of town, and not far from Case Western Reserve and the Art Museum. I'll spend three weeks there for the transplant. Poor Bob, who already has a fifty mile a day commute will be traveling 100 miles a day if he comes to see me after work. But the alternative, if there was one, would be a hospital with less resources than the Cleveland Clinic. It is all very important and very life or death and it simplifies things incredibly. Sort of like entering a religious order for a few months. 'I hand myself over to you, oh medical profession, to be purified in your chemical and radioactive baths.' How can a science fiction writer not be at least somewhat intrigued? I feel sort of hungover today, and it isn't particularly from the two glasses of wine I had last night. Yesterday was an emotional day. First the news from the doctor, then hours of contacting people--—family, Clarion West, University of Wisconsin at Madison, speaking dates and workshop dates. There is no appropriate way to title an email saying you can't meet your obligation because of a scary sounding disease. This is why I started my blog in the first place, so I wouldn't have to tell people over and over. Waking up this morning to twenty-eight well-wishes, now that was really great. Thanks everyone. I mean, I'm a writer. Now only am a buoyed by everyone's good thoughts, but hell, I got twenty-eight comments on my blog! My sister has already suggested (tongue in cheek) that I relapsed so I'd have something to write about in the blog. Monday Bob is taking the day off and taking me on a round of tests--—heart and lungs--and then a meeting with the surgeon who will perform the biopsy. The enlarged lymph nodes are high in the center of my chest, below the thymus gland. They're a bit of a pain to get to. So I'll carry my CT Scans and we'll sit while he reviews the scans, and as Doctor Schnur said, looks at me to confirm that I'm healthy. I really respect that. There are a thousand things that a doctor can assess in an instant that never show up in a CT scan. I got to see my PET Scans. They're very interesting. I can see the cluster of diseased nodes. And my liver, faint as a cloud. It's a strange way to look at a human body. The way a PET scan works is they injected me with radioactive glucose and then after thirty to forty minutes, they scan to see where the glucose is concentrated. Malignancies metabolize really fast, so the glucose concentrates there. They show up black on a pale gray photo. I surely do want and plan to survive this and live for many many years after, but this time around, I thinking that I will concentrate much more on the here and now. One of the questions I asked my doctor was if the high dose chemo doesn't in the end cure me, will it give me time to do things like travel? And he said definitely. This wasn't a question I would even have thought to address the last time around. I'm not a believer in the power of positive thinking or the effect of my thoughts on my malignancy. But I am a big believer in the effect of my thoughts on the moment in which I am living. I had some miserable days when I first heard that there was something on the CAT scan, and I just don't want to do those kind of days. That said, I told my doctor that I felt we needed to be lucky and aggressive. Lucky because, well, so much is beyond anyone's control. Aggressive because that is what is in our control, and the best strategy for long term. That's my medical motto these days. Lucky and aggressive. A couple of weeks ago, Dr. Schnur called me and said that my CT Scan showed enlarged lymph nodes in my chest and that this was a possible sign of Hodgkins returning. He told me I would need a PET Scan and yesterday was the first possible day for a PET Scan. This morning Bob and I met with Dr. Schnur and he said it was pretty clear that I had relapsed. I had made the mistake of checking the internet in the intervening weeks, and had pretty much convinced myself I'd be dead by summer, so the visit was actually quite good. He's very optimistic. He's still talking cure. The only thing between me and that cure is a stem cell transplant and high dose chemo. So I have officially prepared. I made Bob buy me an iPod. I figure if I'm going to have to spend some time in isolation, I might as well be entertained. I'd post more now but I'm going to play with my iPod first. 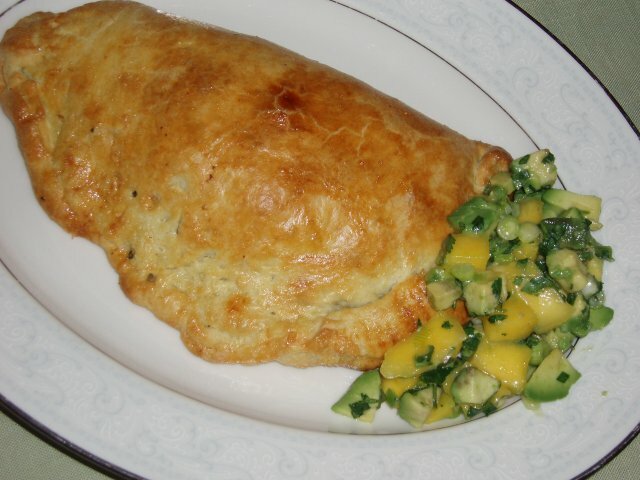 Years ago I read a recipe for Chilean empanadas from Sheila Lukin. Sheila Lukin and Julee Rosso wrote the Silver Palate Cookbooks which in the 80's where THE cookbooks. I have all of them, plus two of Lukin's later cookbooks. The Silver Palate was a catering business and store in Manhattan where I guess you could pop in and buy stuff to take home to dinner. Since Lukins made it in her own small apartment kitchen rather than a professional kitchen, the food had to be good, fresh and not too technical, and the result was a consumer friendly cookbook with tasty and pretty recipes. The food was faintly exotic without actually being from somewhere else. They used a lot of roasted red peppers without being really Italian. They used different kinds of vinegar. This sounds a little silly today, but when I moved to New York the year The Silver Palate Cookbook was published, I had never used fresh garlic. I was from Ohio. I had been taught to scratch cook--I never used minute rice. But I had also been taught that a can of Campbell's cream of mushroom soup was a reasonable substitute for white sauce. The cookbooks used lots of fresh ingredients in tasty ways. Cooking out of the cookbooks, I learned a lot about Sheila Lukins. She likes vinegar and salt (I am a sweets person.) And she likes phyllo dough. I like phyllo, too, and learned to use it at home to make one of her appetizers, which she called Chilean Empanadas. It was, because of the phyllo dough, one of the more difficult recipes, but using a box of phyllo dough is still a lot easier than say, making my own croissants. I followed the directions about damp kitchen towels and tore a couple of sheets, but I got the hang of it. Phyllo (the flaky stuff in baklava) is not very Chilean. And the recipe, while true to Chile in some ways (cinnamon and raisins and beef and hard boiled eggs) was decidedly odd in others. It used corned beef, which strikes me as another less than authentic ingredient (maybe there's a large deli in Santiago?) But it was Full of Good Stuff so I made it one time and loved it. A lot. Company always scarfed them down. I've made it a number of times, but the phyllo dough makes it time consuming. And it makes a lot of little phyllo dough triangles, so if I'm not having a party, I'm not going to make it. Last week I was looking for recipes to use for a writer's group dinner on Sunday, and I decided that I wanted to pretend it was warm. I decided to make chicken in red mole. Looking on Epicurious.com I found a recipe for empanadas made with dough from Cafe Azul. I love reading the responses to the recipes, and every response said the same thing. The dough was wonderful. I made little mini empanadas stuffed with pumpkin, peanut butter, mushrooms, onions and walnuts, and mini empanadas stuffed with Sheila Lukin's corned beef stuffing. The empanadas were too mini--too much dough for the stuffing. But the dough was really good. Light, buttery and easy. I had a lot of corned beef stuffing and a lot of dough left over. So tonight for dinner we had Chilean Empanadas Lukin Azul. I've decided if I want to be a food stylist, I'm either going to need lights, or I'm going to have to start eating dinner earlier on bright sunny days. I made a mango and avocado salsa to go with it. Soak the raisins in sherry (rum works, too) for about thirty minutes until they plump up. Divide prepared dough into thirds. Roll or pat one third of the dough into a rough circle (in my case, very rough.) You want the dough to be about a quarter of an inch thick. Plod a third of the filling in the middle and fold the dough over to make a half moon. Crimp the edges. Make two more. Brush them all with egg wash (beat the egg with the tablespoon of water.) Put empanadas on ungreased baking sheet and bake for 25 minutes or until golden brown. Sift flour with salt into a large bowl and blend in butter with your fingertips or a pastry blender until most of mixture resembles coarse meal with small (roughly pea-size) butter lumps. Beat egg with vinegar in a 1-cup measure using a fork, then add enough ice water to measure 1 cup total. Add to flour mixture, stirring with fork until incorporated. Turn out mixture onto a lightly floured surface and knead gently with heel of your hand just enough to bring dough together. Roll out or pat into a 15- by 9-inch rectangle. Arrange dough with short side nearest you, then fold into thirds like a letter to form a roughly 5- by 9-inch rectangle. Chill dough, wrapped in plastic wrap, at least 1 hour and up to 6 (do not chill longer or dough will discolor). I just had the most fabulous Valentine's Day. Although this will sound weird, it started when I didn't get to buy Bob a card. Because it turned out he hadn't bought me a card, either. And we both were feeling a little embarrassed about it. But when we both had done it, it was okay. But we did buy each other presents. I bought him a Pancho Sanchez CD with lots of Latin rhythms. I had coasted through the music store, putting on headphones and listening to tracks and abandoning them in disgust, when I found Pancho. Turns out that Bob already has a CD by him, but not this one, and he loves this one. I recently had a birthday. Okay, it was yesterday. And Bob was upset because my birthday present wouldn't be ready until today. He also got me a little CD player/radio/MP3 player for my office, so I failed to see how it really mattered, but he got spouse points for caring, if you know what I mean. Tonight, he said, we had to go pick it up before dinner. So off we go to...the frame store? I'm thinking, what? A digression, if you will indulge me. I've had a drink with dinner, so I'm a little tipsy and confessional. Years and years ago I took art history in college and it was one of those courses--okay, three of those courses--that have really stuck with me and illuminated the world in marvelous ways. I learned to love the construction of cathedrals. I learned a kind of basic understanding of Western art. 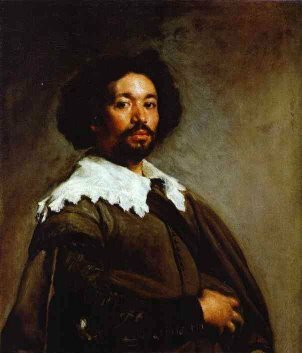 And I fell in love with the paintings of Velasquez. My favorite was the first one I saw flashed on a screen at the front of the auditorium. The Portrait of Juan de Pareja. Who knows why anyone falls in love? I loved the painting. Years later, I turned a corner in the Metropolitan Museum of Art in New York City and there it was. I didn't know that the painting was in New York--I just assumed it was in Italy, where it was painted. Eventually I had to go to the ladies room because it was the one place where there were no paintings on the wall. Otherwise I would have started crying. I didn't expect a painting to affect me that way. I'd heard about people crying at the opera. But it wasn't really me. I'm from Ohio. What I knew about art I'd learned at Ohio University in Art History. It's not like I've talked about this with Bob, you know? No reason. It just never came up in conversation. Hey Bob, I had this personally moving experience with a piece of art, an oil painting, many years ago. Wanna hear about it? But I've written about it. Bob read it in a short short I wrote called "Makeover" which was published by Infinite Matrix. He went to the frame store and they looked it up and the print wasn't available from their usual supliers, so he found it on the web and took it to them and got it framed. Beautifully. Tonight we went and got it and hung it over the fireplace. I got verklempt. I think I'm the happiest woman alive. When I get my oil changed, they fill my windshield wiper fluid resevoir. For a long time, in my old car, a tiny little 1990 Toyota Tercel, I got the oil changed every three to four thousand miles. I planned to run the car until it completely fell apart, and I had heard somewhere that if I changed the oil more often, it would last longer. I'm not good about maintenance, actually. I was quite dutiful about car maintenance, but when it comes to things like watering plants or dusting regularly, I'm really bad. I'm forever thinking I've just done it when actually I did it three weeks ago. But I'm not a particularly heavy user of windshield wiper fluid, I guess, because over the years, since I started getting my oil changed so regularly, I don't run out. When I got my 'new' car (2001 is still 'new' to me) I had learned that unless you live in some place like Mexico where grit is a problem, changing my oil every three thousand miles wasn't going to have much affect on the life of my car. There was a study about it using taxi cabs, and then they talked about it on Car Talk, so it had to be true. I stopped worrying about it. I might have noticed at some point that I still didn't run out of windshield washer fluid, but I didn't think much about it. Maybe the resevoir in the Subaru is big, or maybe I just don't use that much. A couple of years ago, my husband remarked that he had checked the oil in both the cars and filled the windshield washer fluid. "I don't ever run out," I remarked. He gave me a funny look, and then he said, "That's because I always check it and fill it when you get low," he said. I don't know which surprised me more, that I didn't know he was doing it, or that he had been doing it since 1991 and had never mentioned it to me. I mean, if I had been doing it for him, you can be sure I would have been mentioning it, just for the spouse points if nothing else. Bob, the Windshield Washer Fluid Elf. Joseph Beth, a big local bookstore chain (and by local I mean they are headquartered in Lexington, Kentucky, so local in a regional sense) had a program tonight where Dan Chaon (who wrote an astonishing collection of short fiction called Among the Missing which was nominated for a National Book Award and a novel called You Remind Me of Me) sat down with a psychoanalyst and they discussed his novel, You Remind Me of Me. This seemed a strange thing to me. The characters in a book are manifestly not real. Someone (in this case, Dan Chaon) made them up. I really like psychological realism, but I think it's an illusion, just like so much else in fiction. The suggestion of psychological complexity is a characteristic of mimetic fiction--meaning that if you want your story to feel real, you should also make the characters feel like they have a complicated psychological make-up. But characters that are as arbitrary as real people feel thin on the page, just as dialogue that is realistic feels strung out and boring. It's all fake. And a lot of fiction isn't even about psychological realism. Christy Malry's Own Double Entry doesn't feel even remotely realistic, and that is part of the point of that slim, very postmodern novel. It's still a delightful read. Joy Williams writes short stories that feel as if they evoke interesting, complex, personal and true psychological effect, but her characters are often utterly unrealistic, psychologically. In her short story "The Girls" (which was reprinted in America's Best Short Stories 2005) she describes a pair of sisters who are never named and who are so single in their pursuits and outlook that they are utterly unreal. They are all but one person. This is not even remotely psychologically accurate. Even identical twins have relationships with each other. And yet, the way the family dynamic develops, with all its destructive impulses and with it's unexpected moments and epiphanies, feels utterly true to a certain aspect of the human condition. The characterization isn't psychological, but in some odd way, the story is. So when you analyze a story, you are analyzing the production of the artist. But does that mean you are analyzing the artist? Freud said that if you made up a dream, it could be analyzed in just the same way as one you had. Are stories waking dreams? Is this going to be about Dan Chaon? Or You Remind Me of Me? What it turned out to be was quite good. It was a discussion of the themes and characterizations of the book that was informed by the insights of psychotherapy in character. So the characters were discussed, and the way they were formed by circumstances was also discussed. I've been to a lot of readings and a lot of presentations by writers. I admit to a certain fatigue with listening to writers describe how they compose (pencil or pen? Computer?) and where and how they were first published (did they have an agent?) The discussion started with Dan talking a little about the impetus of the book and some ways in which the fiction was related to his own autobiography, and then some of the ways in which it wasn't. Then the psychoanalyst (a smart and interesting woman) commented on the themes of the book and on how people invent themselves in a kind of narrative of self. Then the audience asked questions and pretty soon everyone was involved. It was quite wonderful. A good audience, a smart and articulate writer, and a smart and articulate commentator. Afterwards, I talked to the woman who put it together, who would like to do Mothers & Other Monsters. I think it would be way cool. Last night I was lying in bed and getting ready to sleep. Everything was great. Bob was falling asleep. I was in my own bed and comfortably tired. And for a moment, the world just turned awful. It doesn't happen to me very often anymore and it went away in a moment. I was thinking about it and it occurred to me that the feeling was a lot like when I really noticed eyebrows. I was watching TV the other night, just killing time until Bob, who was playing his WWII submarine game and had to sink one more freighter, would come to bed. They were talking about fashion and they mentioned the fashion sin of over-plucked eyebrows. They showed Pamela Anderson, who apparently is the poster child for over-plucking and then went on to mention that Whoopi Goldberg has no eyebrows. Which I admit, I never noticed. I, of course, went for a number of months with no eyebrows or eyelashes or body hair. I learned to draw in eyebrows pretty well. The idea being that when you glanced at me I didn't have that boiled egg look, that perpetually surprised look I had without eyebrows. To draw in my eyebrows, which I admit I had not paid huge amounts of attention to before, I looked at other people's eyebrows. And eyebrows are weird. First of all, human hair distribution is weird. Non-aquatic mammals tend to have hair. The ones that don't we think are weird. 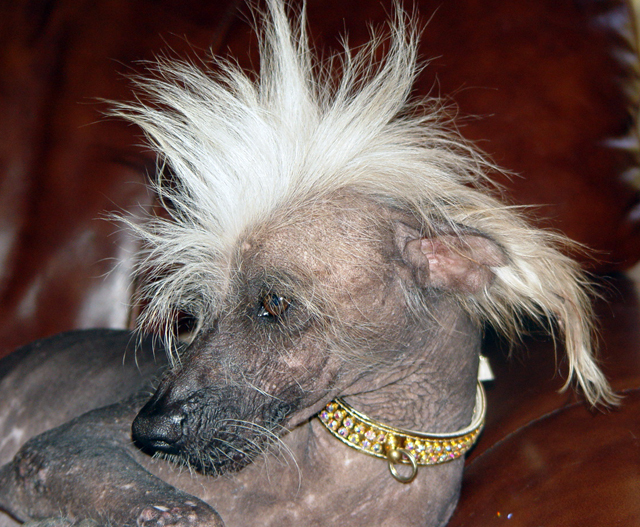 Like Chinese Crested dogs. And eyebrows are these two patches of fur (okay, one long patch of fur for some people) that are stuck between our eyes and our hairline. I know what they do. They act as gestural punctuation. They go up, they go down, they come together. When someone's face is a rest and the eyebrow rides on the edge of the orbit, the bone depression where the eye goes, they look okay. Raised they ride in the middle of the forehead and they are more clearly just these weird bars of hair stuck on our face. Sit at lunch with a group of friends when you are noticing eyebrows, and watching them go up and down, and thinking how hairless we are in general and how weird our distribution of body hair is (I mean, are they supposed to keep our brows warm and insulated?) and if you are like me, you'll find it very hard to concentrate on what people were saying. Sitting at lunch one day with friends, watching eyebrows, the world was briefly very strange. People looked odd. They didn't look like people I knew but like these animals with weird fur. There are a lot of ways to invoke this feeling of the strangeness of ourselves. Bob once pointed out to Adam (who was a kid at the time) that your tongue is really a little too wide to sit between your teeth. Adam said, yeah, it is. And then was self-consciously aware of his tongue for some time. Which is the whole point of the observation, of course. They laughed and kidded and then we rode in silence (we were on a car trip) and Adam had the annoying experience of really noticing his tongue. Lying in bed last night, this sudden feeling that the world was awful, that everything was filled with malevolence, went away in just a moment or two. When I was younger, it sometimes used to persist for weeks. I never told anyone about it. I didn't know how. It never occurred to me that other people probably had the same experience. It took a long time for me to learn how to relax and let go of the feeling and I suspect that anti-depression medication played a part in that. It goes away. And my feeling that eyebrows were weird went away.